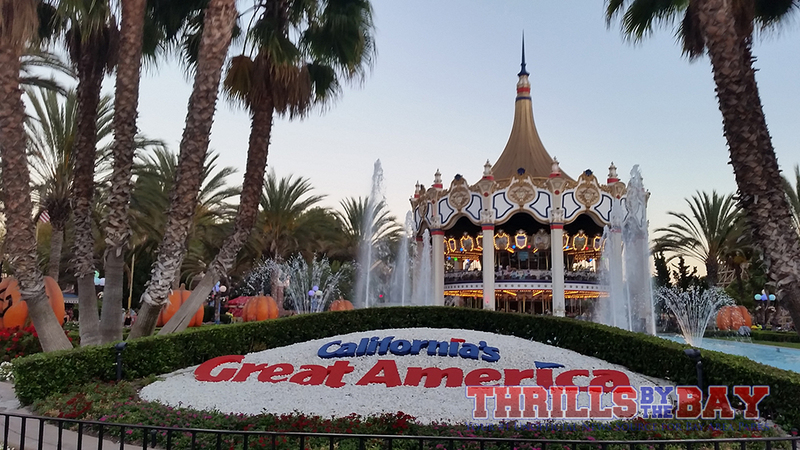 Crowds were sparse which meant that every ride was pretty much a walk-on. 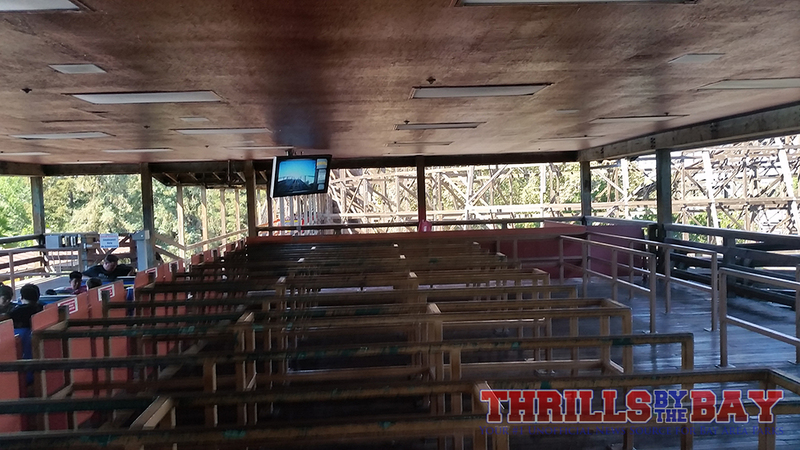 We were even able to take in some of our first rides of the season on Grizzly as the station was empty! We won't bring up dispatch times though, and we will not mention about why dispatch times are affected, no need to beat a dead horse. 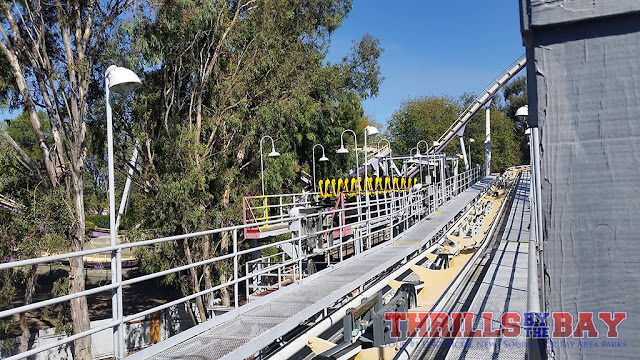 We will say that it was awesome to be able to walk right onto Gold Striker, often times being able to re-ride without leaving our seats! A rare image of an empty Grizzly station, with no line behind at all! An empty Flight Deck station. Sadly, the ride broke down as soon as we got seated. 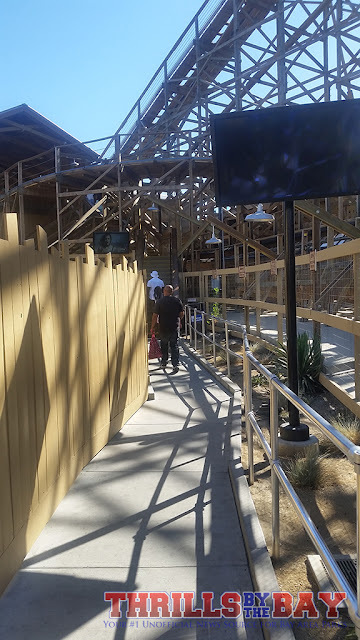 Empty Gold Striker line, not going to argue this one! Now, the juicy Haunt stuff. Let's head toward where The Gauntlet (RIP) used to be. New for 2015 is Lockdown. One of the first things you'll notice are large shipping containers stacked on each other in Orlean's Place. 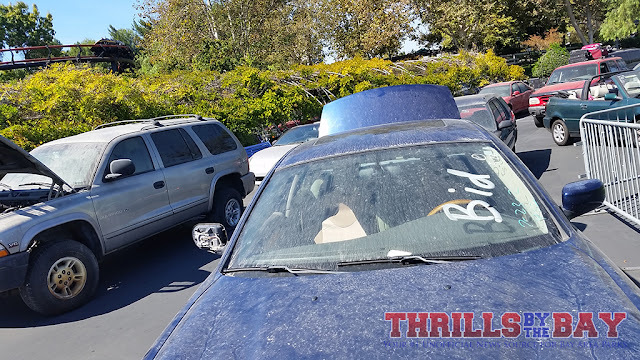 There's about 3 stacks and it looks like it could potentially provide some blind corners, setting up for the perfect jump scare! 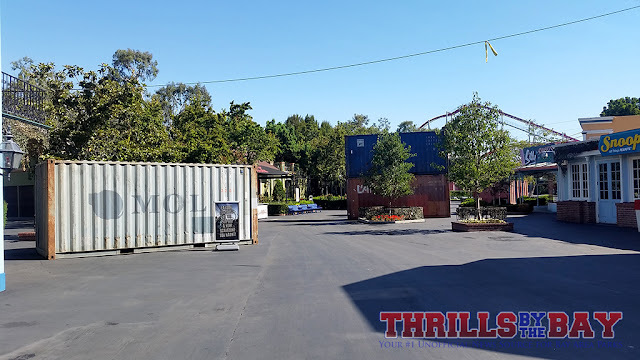 Lockdown will compliment the new Insanitorium maze (Replacing CarnEvil, again RIP). We are very excited to see the final production. 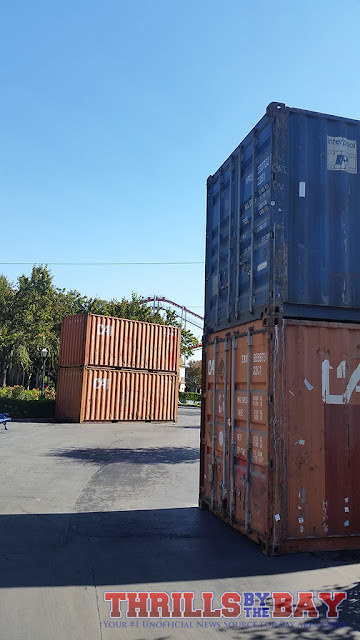 Our next venture was to check out the new Evacuate. This has to be one of the craziest-looking scare zones in the park. 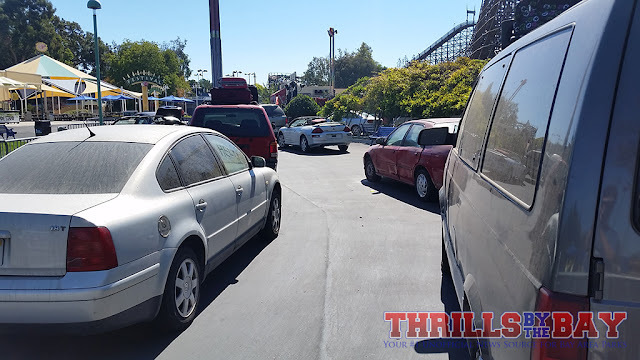 As you enter the County Fair section of the park you'll notice what looks like a traffic jam...strikingly similar to a weekday commute on 237 during rush hour. There are also cars lined up inside the arbor tunnel. We are curious to see how this all pulls off. 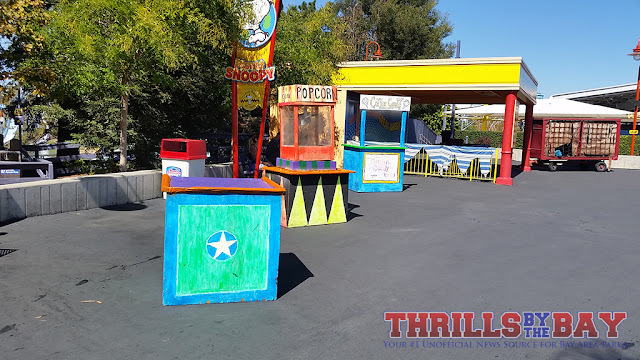 Who would have thought that the park would have invested in a bunch of real vehicles for theming for a scare zone? This looks like my commute home from work, especially on a Friday! Last of the new scare zones we made it through was Killer Clown Town. 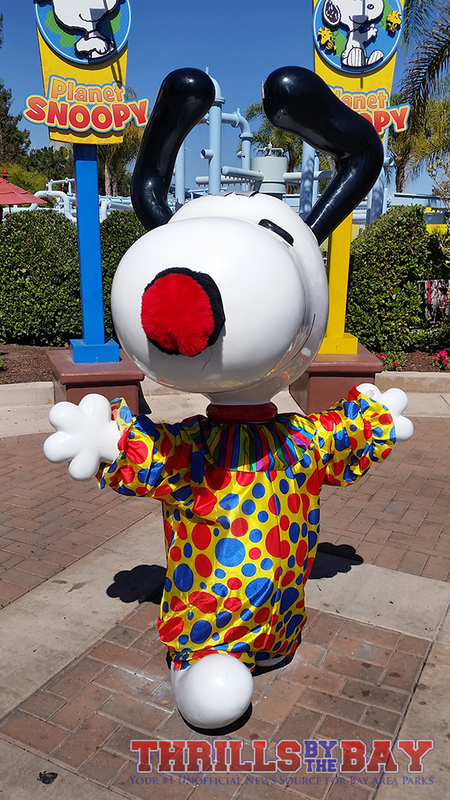 This scare zone takes place in the back loop of the original Planet Snoopy area. One can call this a possible spiritual successor to Gauntlet. We noticed that there were a lot of recycled props, giving a nod to the former Gauntlet, as well as several props from CarnEvil itself. I wonder if they'll play the CarnEvil song sans lyrics for atmosphere. Gone though is Jack. 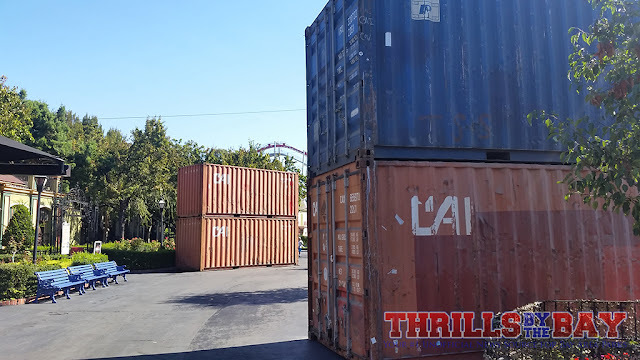 He was a Gauntlet favorite of ours, it was always fun watching guests come up only to have this massive Jack in the box pop up scaring them off. Recognize any of these props? Now, let's take a look at the rest of the park. A few noteworthy things: Toy Factory's sign is incomplete, currently reads "Factory." (Very similar to how Rip Roaring Rapids is just labeled as "Rapids"). 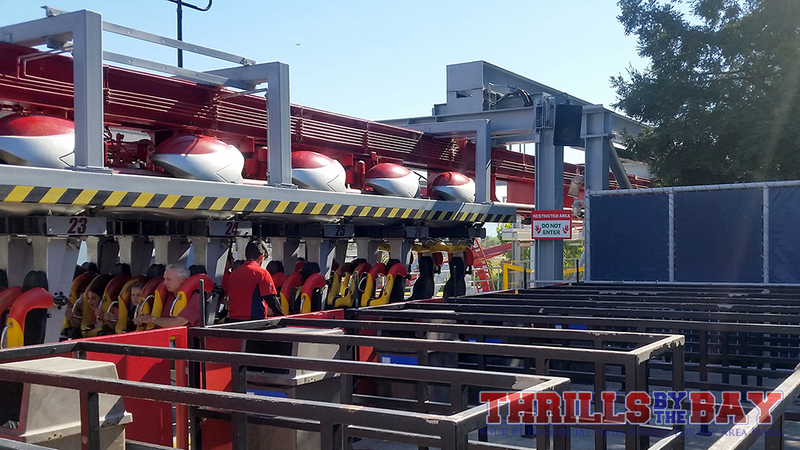 Vortex is currently running a single train and running "ok." We've had smoother rides on it. 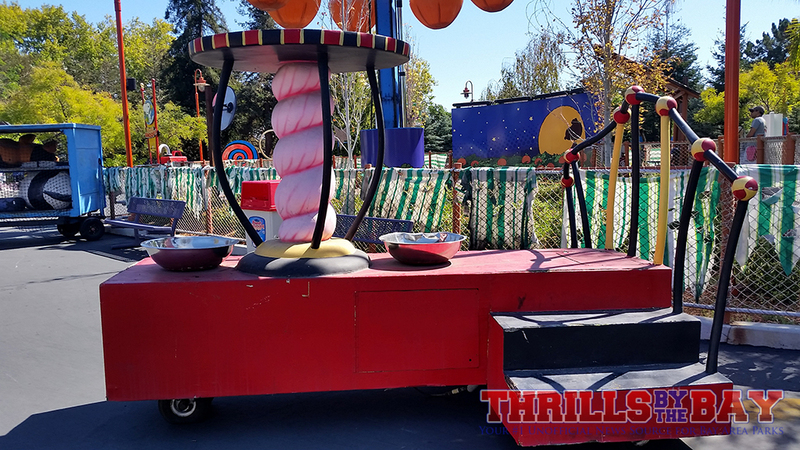 Stand up coasters aren't particularly comfortable rides to begin with, especially with the corkscrews. Here's some random photos from around the park. 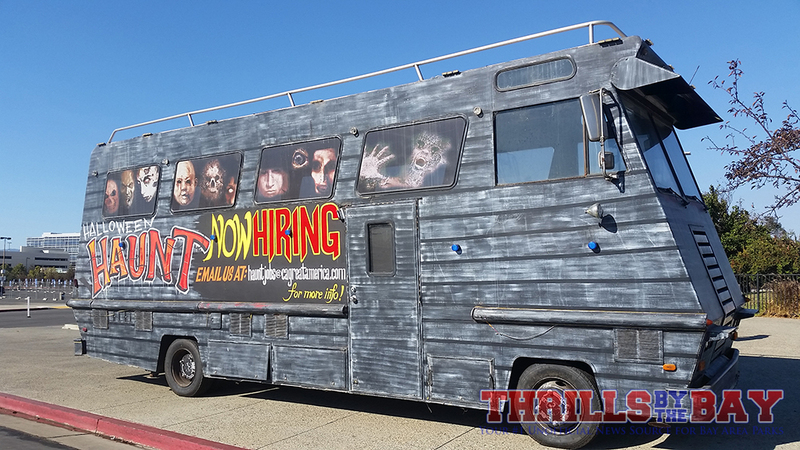 Haunt is hiring. If you're interested, be sure to drop them an email! 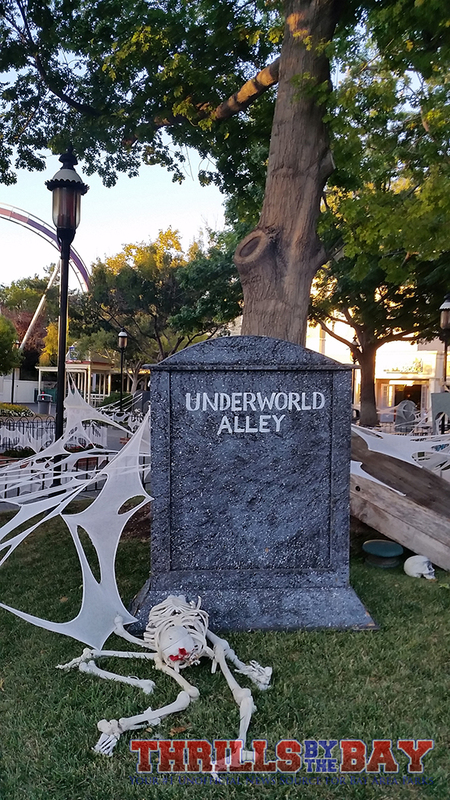 Vortex is down to a single train, just to forewarn you on those busy Haunt evenings. 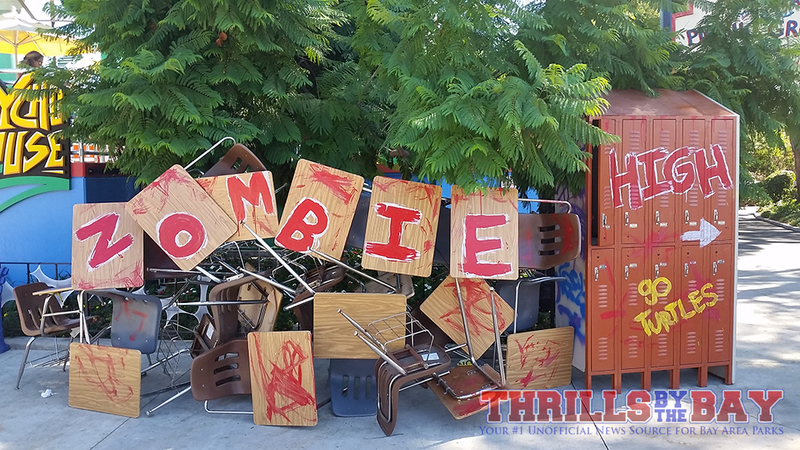 Zombie High sign - I've always liked how they used the desks here. 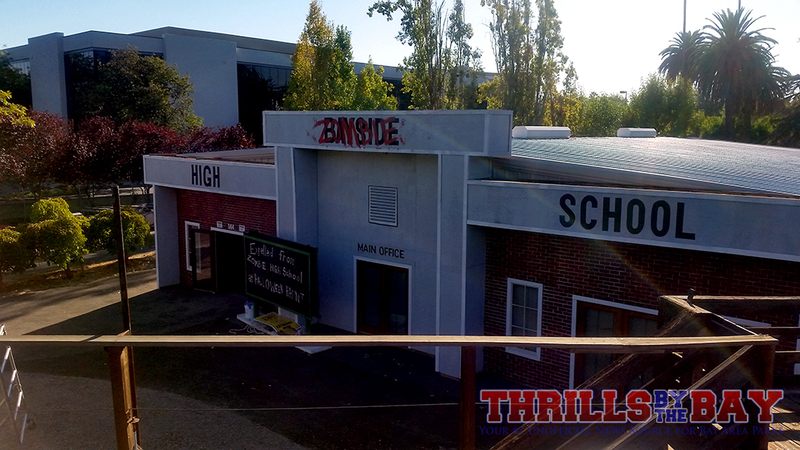 Zombie High, soon to serve its students! 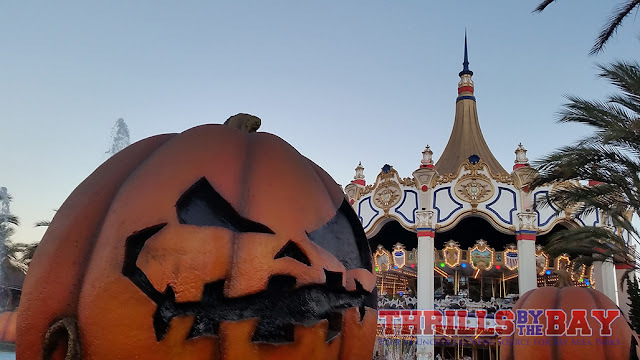 Pumpkins surround the Carousel Columbia reflection pool. 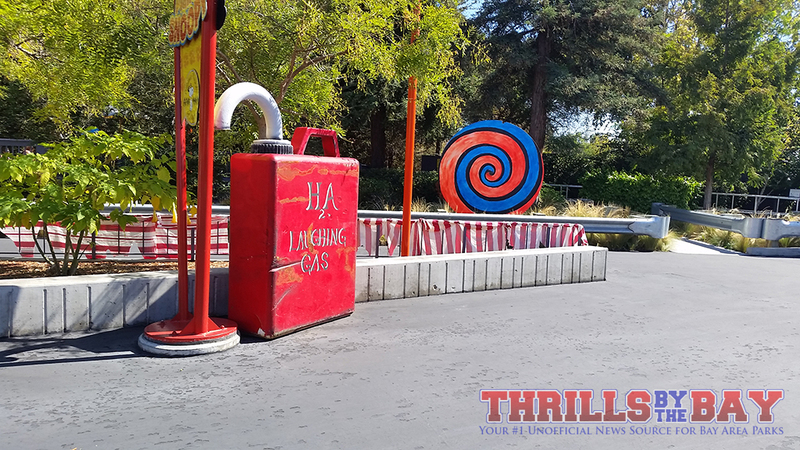 Hopefully those flame throwers make a return!